FYI–Guatemalan weaving tours. November 2012 tour still has openings, accepting reservations for April 2013 tour. On September 17, 2012, judging took place for the 2012 Sheep to Shawl competition. Five guilds took part in Sheep to Shawl this year. Each guild came to the fair with a handspun warp ready for the loom. They were required to prepare the fiber, card and spin the weft for the shawl at the fair. 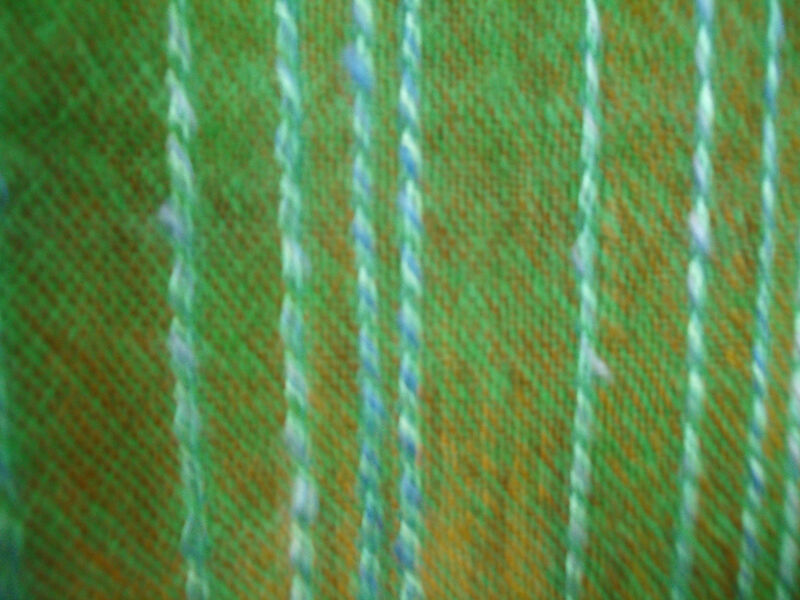 The warp was threaded on the loom and woven during the 12 hour competition. Cheryl Reed of Richland was the judge for the competition. She is a Northwest Regional Spinners Association certified judge. Judging took place in front of an audience of fairgoers including many guild members. She was required to look at both the spinning and weaving skills of each guild and the overall final product. She was quite impressed with the high level of skill shown in the five shawls. Arachne Guild did a friendship scarf earlier this year. We decided that making our shawl in the same manner would involve more members in this project. 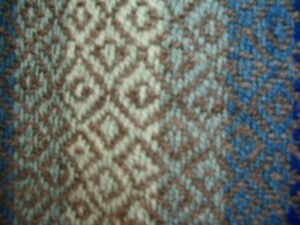 Each member was requested to bring handspun yarn of their favorite color to be used in the mixed warp. 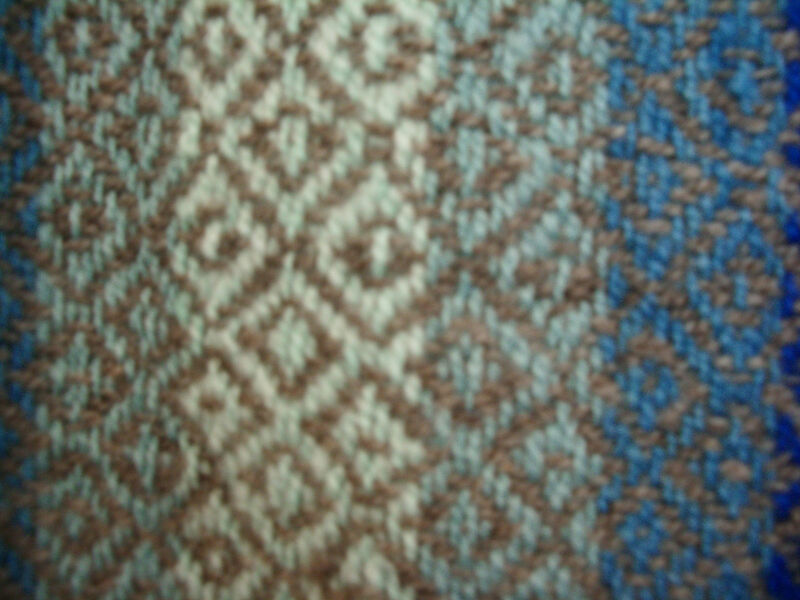 A gray weft was used to weave the shawl. 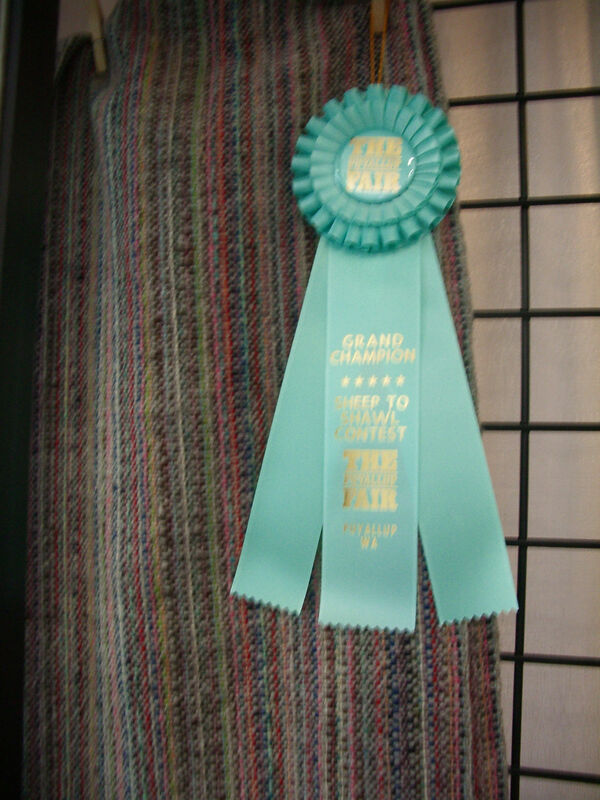 Reserve Grand Champion was won by Olympia Weavers Guild with their 4-shaft lace weave shawl lacey iridescent soft weave capturing the contrast between colors and textures. It was inspired by a photograph of red flowers and green foliage. Each of the remaining shawls highlighted skills in different areas which were recognized by Award of Merit ribbons. 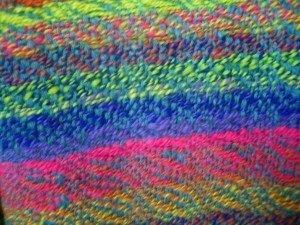 Moonspinners’ “Mer Undulata” inspired shawl of bright colors based on bright color fish in the sea won “21st Century Esthetics”. The judge thought it would be something a young person would wear. 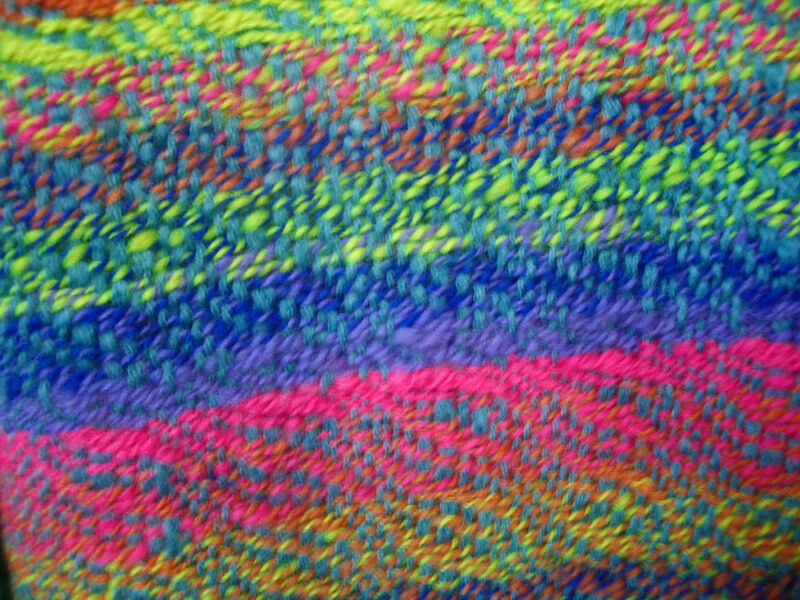 They used bright color stripes on an undulating twill weave structure. 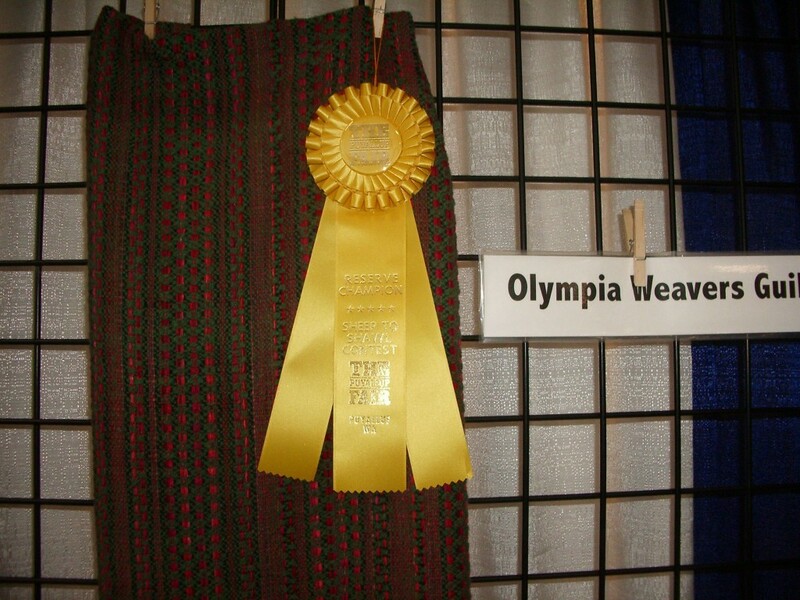 Seattle Weavers Guild was recognized for Best Spinning. They used a guild-wide competition for the shawl design. The spinning team selected the winner. 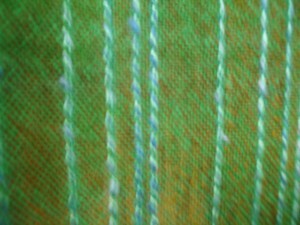 A team of dyers worked on the warp stripes in various shades of turquoise. The competition is done by six member teams over a 12 hour period. They do the spinning of the weft and weaving at the fair plus fringe treatment during that time. They have a few days to finish the shawl before submitting it for judging. The shawls are on display at the northwest corner of the Merchants Building under the Grandstands for the remainder of the fair. No doubt teams are already thinking about their plans for next year’s fair. Hi fellow weavers and spinners! It’s that time of the year – time for great shows to share our love of all things fiber art. I have attached the poster for the Whatcom Weavers Guild annual Fibers & Beyond Show and Sale, which is on October 12th and 13th, at Fox Hall in Bellingham. Details to find us are on the poster. Please print, post, email to your members, include in your newsletter or website – we welcome all our visiting fiber enthusiasts. This year, we have expanded our offering to include arts and crafts by our spouses – those long–suffering folks who help us set up, take down and generally carry around all our equipment. Come see what they have to offer! The 2013 ANWG NW Weavers Conference will feature more than 75 workshops, seminars, and one-day classes. The courses include beginner to advanced instruction in a wide a variety of fiber techniques, including weaving, spinning, dyeing, papermaking, software, backstrap weaving, jewelry making, braiding and more! The conference will be June 17 – 23, 2013 at Western Washington University, Bellingham, WA. These workshops and seminars are designed and taught by weaving and textile experts from around the world. The conference workshops will begin June 18, 2013 and the seminars and one-day classes will begin June 21, 2013. The conference fees include enrollment in three half-day seminars OR one full day class and one half-day seminar. Workshop fees are separate from the conference fees. The registration booklet will include information about the conference fees, workshop fees, housing, the events scheduled and more. The registration booklet will be published in mid-November and on-line registration will open mid-January, 2013. Descriptions of all the workshops, seminars and one-day classes are now available on the conference website. Information about the conference’s world-class instructors is also available on the website. 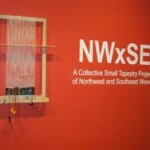 The 2013 conference theme is “Crossing Borders, Crossing Threads.” It is an appropriate theme for a weaving conference at Western Washington University, so near the Canadian border in Bellingham. It is a theme that honors the influences of the many cultures whose people have crossed borders and brought their weaving and textile traditions with them. The theme also celebrates the influences of woven borders and traditional cultures on design and color in our modern world. Those interested in receiving conference updates should visit the website (www.anwg-conference-2013.com) and sign up for the conference newsletter.